With many fashion designers having jumped on the vintage craze, a whole array of Melbourne vintage markets has sprung up, creating a vibrant melting pot of old-style fashion and hip creativity. They are listed below. With typical playful passion Melbourne has become the vintage capital of Australia, if not the world. There are red lips, 50s frocks and old style hats, vinyl records, barbers and handmade shoes - a vintage look that fits well into Melbourne's cafes and bars, many of them decorated with an eclectic mix of old tables, chairs and objects. There are inner-city corners teeming with vintage designer shops and bars, offering old style 'slow' experiences, valuing sustainability and quality. Even op shops have jumped on the vintage craze and are selling 'vintage' clothes at prime rates. Vintage fashion is melting into the cutting edge fashion design. Many up and coming vintage markets have sprung up in bars and hotels, bringing food and music into the vintage fashion. Here is a page if you are after trash & treasure bargains. The Lah de da Bazaar is a monthly event held at Biero Bar in the city. Definitely a great place for cutting edge fashion hunting - both for unique vintage and local fashion labels! It is supporting young and 'unseen' Australian fashion designers, many of whom are using vintage materials. Lah De Da is uniting the old and the new. You will find amazing craftsmanship, a treasure trove of romantic finery, exquisite garments and accessories of up and coming fashion and vintage labels, presented on mini runways. It is on at Biero Bar in 525 Little Lonsdale Street. This monthly indoor market is held in the cosy rooms of the Perserverance Hotel in Fitzroy, the heartland of hip Melbourne culture, art and design. The latest in up and coming fashion, handmade design and creations, as well as vintage clothing - all the while you are entertained with live music, DJs, artist installations and great food and drink. Blackbird Market is held the second Sunday of every month from 11am to 4pm at The Perserverance Hotel, 196 Brunswick st Fitzroy. 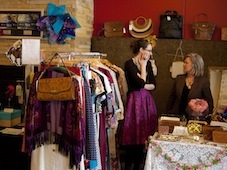 This is another one of the Melbourne vintage markets, held at the St Kilda RSL Club. It is great opportunity to hunt down that perfect bespoke or by-gone era piece of treasure in the attractive St Kilda. It brings together a wide range of Melbourne's talented artisans and vintage purveyors, offering vintage collector pieces, stylish preloved gems, millinery creations, as well as quirky bits and pieces, jewellery and fashion. All in great atmosphere with RSL priced drinks and opportunity to lounge-around or walk to the beach. 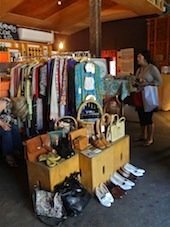 On the last Saturday of every month (except September & December, check dates), 11-4pm, at the St Kilda RSL Club, 88 Acland St.
A market of all things treasured, vintage, and indi. It is on once a month the Dancing Dog is filled with vintage and pre-loved clothing, jewellery and some contemporary local art. Another opportunity to hang out - this one in the West - to eat & drink, and appreciate local talent. Also a place to catch a vintage bargain or second-hand frock. Second Sunday of the Month at the Dancing Dog in Albert Street, Footscray. This funky monthly market is located slap bang in the middle of Errol Street, North Melbourne. It's a small market in the Lithuanian Club, but full of cute, designer, original as well as some vintage stuff! The North Melbourne Market stalls sell vintage fabrics and clothing, sweet treats, local designer fashion, kids head-to-toe cute stuff, handmade jewellery, homewares, artists creations and other particularly and peculiarly unique things. This is a quality vintage, vinyl and bric-a-brac market, offering a range of vintage men's and loads of vintage ladies dresses, shoes, bathers, coats, shoes, scarves and trinkets. The idea of this market is to start late, have music and entertainment as well as cool wares to enjoy. There are pop-up stores from well-known vintage collectors selling their finds, with some stuff from the US and Europe. The Collingwood Hello Sailor events are huge vinyl fairs and a heaven for vinyl collectors. It is held at the Melbourne Central Shot Tower or Yah Yah's in Collingwood. A place to buy and sell vintage and recycled fashion are the Sunday Take 2 Markets. It started in Hawthorn as an eastern suburbs vintage market, but has since grown and established itself in various locations. It is held at various dates at Northcote Town Hall, Geelong West Town Hall, One Community Church Blackburn & Barkly Square Brunswick. Round She Goes is a pre-loved women's fashion market that happens four times a year in the Moorabbin Town Hall. It has been a hit in Melbourne's southeast and is a local favourite. You can buy pre-loved designer and quality vintage fashion and accessories from 100 different stallholders, as well as also designed jewellery, accessories and craft. So, vintage lovers and op shop fans, don't miss that opportunity for a bargain. Kingston City Hall/ Moorabbin Town Hall on the Nepean Highway. This is one of the occasional Melbourne vintage markets at the Mornington Racecourse and looked forward to by many on the Peninsula at the end of the year. It is a small, 65+ stalls, market, selling vintage, designer and current fashion, pre-loved women's clothing and accessories. A great place to find a bargain! Loved it is on once or twice a year at the Mornington Peninsula. Do you Have a Pre-loved Treasures Tips? Where do you find second-hand bargains and vintage goods in Melbourne? Why not tell us about it?